We check all areas of the house with the main focus being weathertightness. We FIND leaks! Being truly independent means we have no connection with any building company, real estate group or anyone else with an interest in what will be in the report. Most houses on the market aren't brand new, aren't covered by "warranties" or "guarantees" anymore, so if something goes wrong, it's not going to be a "free" fix. When you buy a used car, you get it checked right? Well NZ House Check does the same thing, but for houses! This is one of the most flexible moisture meters available. It gives us the ability to accurately assess whether or not there is excess moisture present within the wall cavity. Best of all this can generally be done in a completely non-invasive manner. If we get an unacceptable reading in an area this is the first indication there may be a problem. We can then go on to use Invasive electrical resistance testing or probe testing. Although this is invasive testing the only marks it leaves are 2 little pin pricks 2mm in diameter. This test will give us an accurate measure of moisture content within the timber. Use this link if you wish to look at the exact capabilities of this machine - www.accurate.net.nz. Contrary to what some companies and advertisers would have the public believe, this technology does NOT allow you to "see inside walls”. Thermography measures temperature NOT moisture. A thermal imaging camera simply sees the surface heat of whatever it is looking at in a completely passive manner. A properly trained operator can interpret the images to determine some of what is happening behind a surface. There are limitations though, making proper training & quality equipment essential. We are now able to offer a Meth Testing service on "at risk" properties. We can give you results on the day for up to 5 rooms of your choice. If we get any positive results then further investigation will be required. 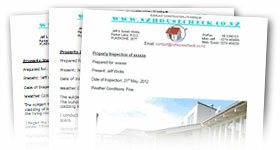 You can have a look at what a report will look like when you have us inspect your new property. Please click the download button below.